This blog is about WordPress security. 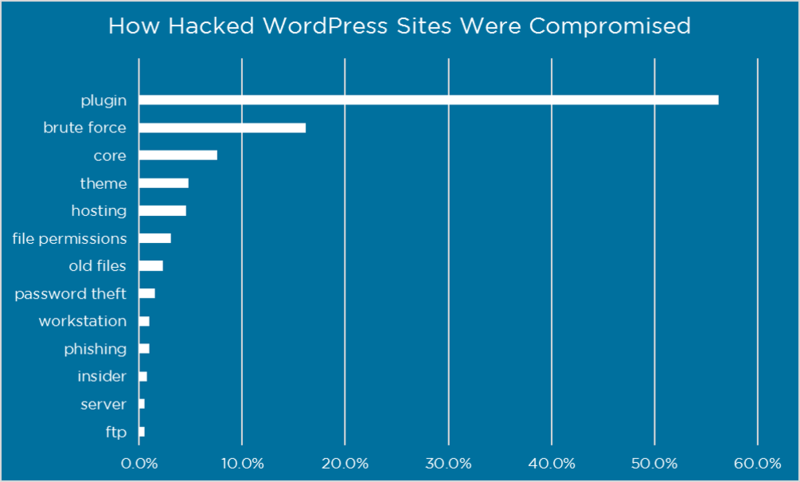 While WordPress is the world’s most popular software for websites – as open source software it’s prone to hacks and attacks. Sadly, we, as web hosting and development companies spend far too much time worrying and working on being vigilant on behalf of our clients who rely on us. For clients of searchtrafficnow.com – you don’t have to worry – we are watching your site, updating plugins and putting features in place to keep your site secure. This post is designed to educate you a little about website security. A recent study done by wordfence – a popular and good security platform shows the following. The scary truth is that most website owners don’t know they’ve been hacked. Some sites go for days, months and years being exposes to some really bad stuff. Worse 61.5% didn’t know how the Attacker compromised their website. As you can see the most sites are compromised by plugins. These are software modules that developers use to provide varying enhancements to your site. Plugins are what make wordpress so popular. There are over 43,000 plugins available for download in the official WordPress plugin directory. The average site should have 15-20 plugins so it’s a wonder why there are so many. The point is that it’s nearly impossible to monitor these plugins which, when not built properly or updated provide an easy back door for someone looking to exploit your website.